So, unless you live under a rock, you know today was the big day in England. Many speak of being sick to death about hearing of the royal wedding, but how many of those were secretly peeking today? My husband knew I intended on watching. As a newlywed when Charles & Diana wed, I tuned in. I told him last night I had every intention of watching this one too. It was wonderful to see such happiness on tv. There is so much ugly on there! 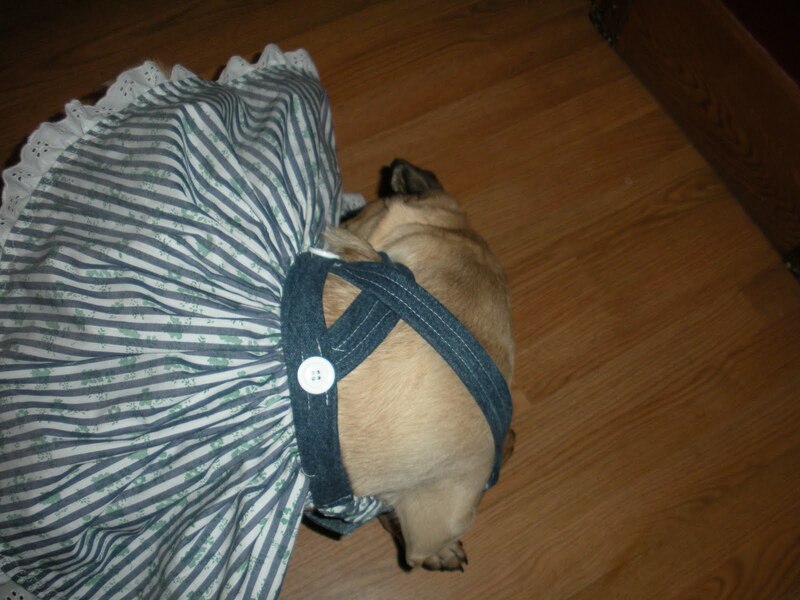 So first, the dress. The dress was beautiful. Sleeves! I love sleeves. I know the style has been strapless, and I DO love the look of strapless, but I am more than a little tired of seeing beautiful brides "pulling" at their tops all day! I think I secretly loved too, that the style she picked was much like my own gown and that now C is thinking...hmmmm, mom's dress???? That would be awesome!!! Also, how about those hats????? HOLY HATHEAD! The hats were crazy! Besides the Kentucky Derby where does anyone wear a hat here in the US??? 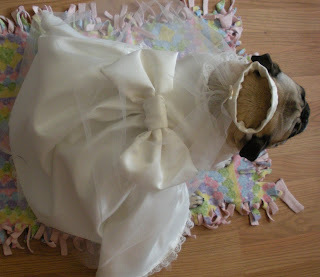 Zoey wanted to remind everyone that she too looks beautiful decked out in wedding attire! 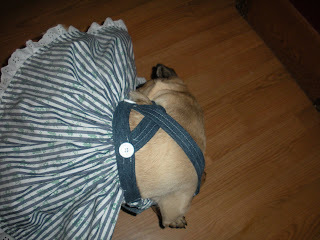 Last year I dressed no less than 5 little Pug brides and countless bridesmaids. If you or anyone you know is getting married and wants your little fur pal involved don't forget I L-O-V-E to see custom stuff. 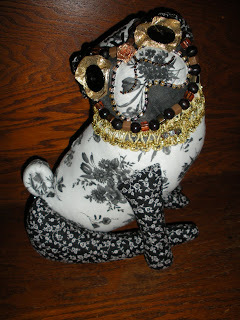 Pop over and visit my shop Pugpossessed! I was super excited to discover that I had received a package yesterday. My purchase from Karen arrived! Karen lives in Guam and designs the coolest little stuffed Pugs! Karen finally has her Etsy shop up and running! You can visit her blog here and her shop here. 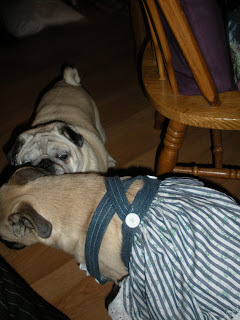 I ordered little Kibibble the week our little Zoey was ill. 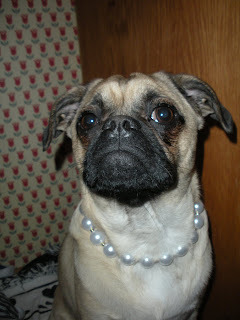 I think she sort of looks like Miss Zoey! 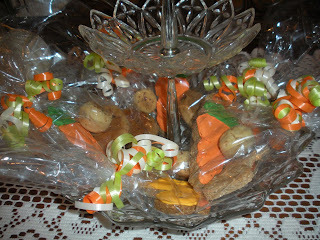 I had my favorite bakery, A Barkers Dozen, make me up little Easter treat bags. Then I made the gang wait while I hid them....please note the word "hid" might be a bit wrong... then they all ran into the room and "found" their package.....well Marty really wasn't sure about the rules of the game! Kiki may have been checking them all out to see if one was better than the other.... It all probably would have been much better if I could have found the video on my camera too! From our house to yours, may God's love shine upon you all! 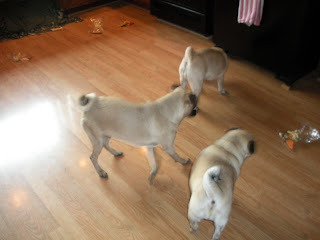 KJPugs Ordinary in Indiana is celebrating her one year blogoversary today. 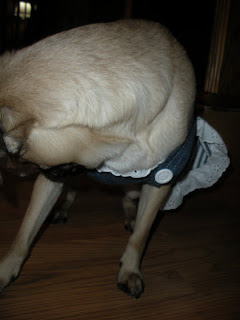 In honor of it all, she is hosting a give-away from Lydia & Pugs! 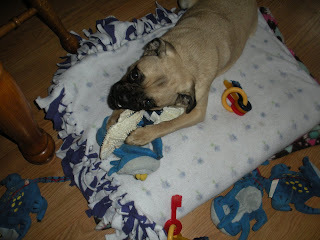 Hop over, read her crazy blog and see how you can enter to win too! Take some time to visit Lydia & Pugs also! 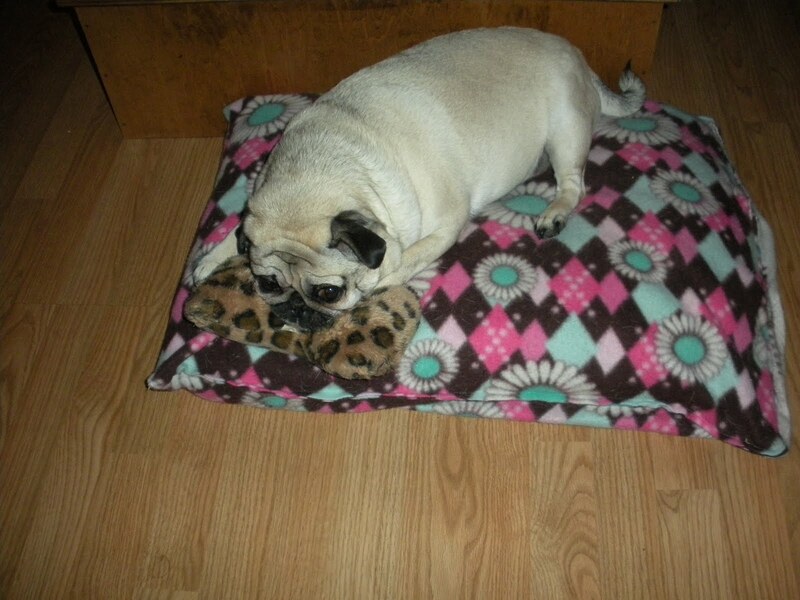 She has some adorable dog-themed items! 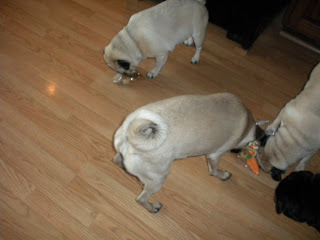 The Slimmer gang introduced us to Mama T and her little furry ones Richie & Ronnii. Ronnii is having a party on Saturday, but her bro Richie crossed over the Rainbow Bridge...he left instructions the party is to continue. Looks like a great weekend for a party! Congrats to Nicole & Kelly! Our bloggy friends Nicole and Kelly got married this past weekend! 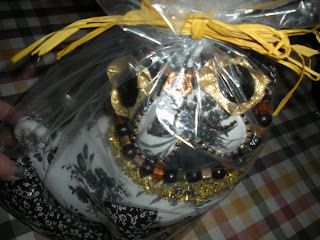 I cyber met Nicole a while back when she won my entry to the SewMamaSew Give-away. She got a tie collar at that time with the intent with her little guy Clyde eventually wearing it. 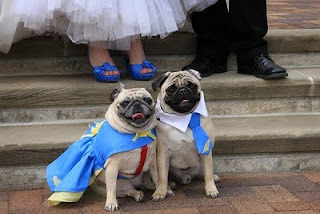 A few months ago she contacted me to make outfits for her Pugs for her wedding. We tossed around her ideas and I came up with something that incorporated her wants! Cornflower blue and yellow, ribbon roses (which I lovingly handmade!) and appliqued yellow birds. 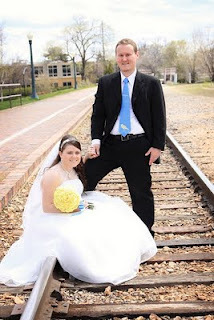 She shared a pre-wedding photo with me of her sweet little girl, Maggie and asked me if I would consider making the human ties to match the doggie tie. I'm always up for something new... and I made my first group of human ties. I think the groom looks dashing! I love the yellow and blue together and it looks like the weather cooperated for them! Happy Happily Ever After Kelly & Nicole! 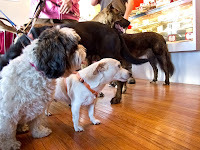 On the 9th of this month the official grand opening of the shop was held. This was also the day Zoey took sick, so I was a bit off my mark all day. Thankfully it is literally less than 5 minutes to get there, so I went back and forth between home and there several times during the day. 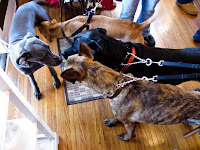 Most of the day I felt like I was at a dog show. So many different breeds and SO many people with multiple dogs! All different sizes.... All different colors.... 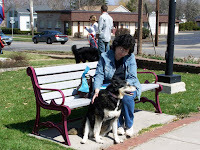 There was an Easter Egg Hunt, photos, and raffles throughout the day. We won a discounted photo package, which we'll be utilizing real soon! 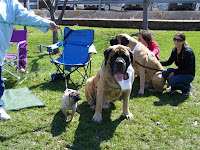 Our buddy Largo sat for a photo with little Miss Patty. She's the little blind foster my bf is taking care of right now. 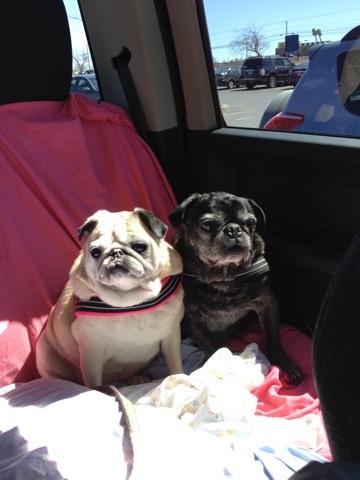 Anyone out there interested in a sweet little blind Pug???? By the way, shhh, don't talk too loud, I'm not sure she knows she's blind! My sweet little Zoey is feeling mighty fine today! I feel blessed. During this week have felt so helpless and sad over her being sick. 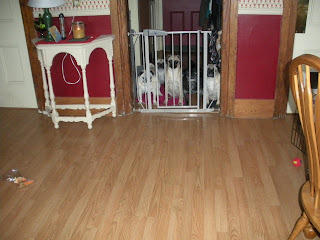 I allowed myself to go to dwell on the fact that these blessed little fur balls will not be here forever. I have seen many of you loose your babies. Like many of you I read the blogs and watch the videos and cry. Cry knowing that each of us must take a turn and knowing I am SO not ready for it to be my turn. 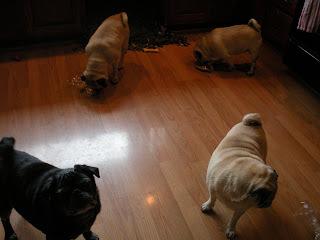 So I will count my blessings and remember that the death of my own mom 10 years ago brought Pugs into my life, so from my greatest loss came so many wonderful things. 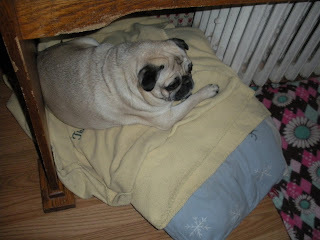 Thanks to all of you for your kind words and thoughts during Zoey's illness! 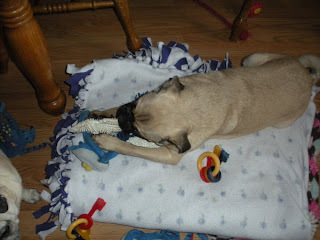 How can you tell when a Pug is feeling better????? Thank goodness Zoey has now eatten 2 meals in a row. The real test will be what the kitchen floor looks like when I go home at lunch AND the bloodwork results that will be in later today. Thanks to all of you for your kind get well wishes here and on *facebk*. So far Zoey is not responding to the treatment prescribed by the emergency vet clinic, so we are off to our own vet today at 5p.m. Until then I count the minutes until I can get my little girl better! We'll be back to blogging soon. Little Zoey took sick on Saturday. We took an early morning trip to the emergency vet today and she is resting comfortably. Times like these I wish these little furry ones could TALK!!!! 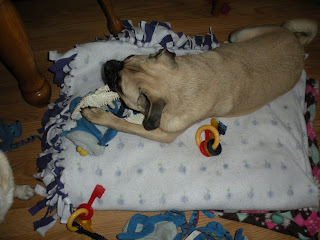 very busy..... seriously busy..... and a girl can never have enough stuff to chew on!